There's nothing I like more than a little bit of colour to my skin. I'm not too much of a fan of sitting out in the sun for health reasons and also because I'm desperately trying to stay looking as young as humanly possible. I generally have my husband do a spray tan for me and then I will use various products to keep the colour on the areas that fade faster like my hands and face. 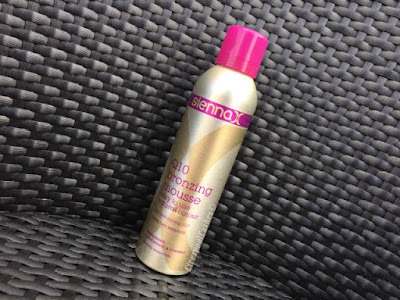 Sienna X isn't a brand I have gotten around to trying so I was extremely excited to try this mousse. Being paraben and cruelty free as well as containing anti-ageing Q10, it ticked all the immediate boxes for me. After fully prepping my skin with an exfoliate the evening before, I got to work applying the mousse. The directions state to apply either with a mitt or with latex gloves, I chose to apply with gloves. This mousse has a guide colour which I love because it makes it so easy to work out where you are up to so there is no surprises in the morning! The packaging states is contains pomegranate and blackcurrant so naturally I was expecting it to have a sweet scent however I feel like it has more of a typical sun tan lotion fragrance which is fairly pleasant. The colour develops between 2 - 4 hours but you are to wash off the guide colour after 8 hours. When I showered the next morning I expected more guide colour to fall away however it didn't seem to be much that came away. The colour I was left with was extremely natural. This product is meant to be a 'dark tan mousse' and I must admit that I don't agree with that at all. I would say that this tan is more on the light to medium sides of the spectrum which I prefer by far as you can always build up the colour. I'm seriously impressed with the tone of the colour in particular, to the point where as I may even look into trialling Sienna X's spray tan solution if this is anything to go by. The bottom line is, I really enjoyed using this mousse. I would say that the biggest plus for me is that usually with a false tan I always have that typical scent on my skin for a day or two after washing the guide off, however with this it was virtually fragrance free by the next morning. I would say that you would need to be seriously quick with your application as I felt like it soaked into the skin almost immediately which, of course, is brilliant so that you can carry on with your day. That aside, it was very easy to use and I'm looking forward to a healthy natural tan for summer!